^ Jacobson, R. A.; Antreasian, P. G.; Bordi, J. J.; Criddle, K. E.; Ionasescu, R.; Jones, J. B.; Mackenzie, R. A.; Meek, M. C. et al. (2006). “The Gravity Field of the Saturnian System from Satellite Observations and Spacecraft Tracking Data”. The Astronomical Journal 132 (6): 2520–2526. doi:10.1086/508812. ISSN 0004-6256. ^ Hammond, N. P.; Phillips, C. B.; Nimmo, F.; Kattenhorn, S. A. (2013-03). “Flexure on Dione: Investigating subsurface structure and thermal history”. Icarus 223 (1): 418–422. Bibcode: 2013Icar..223..418H. doi:10.1016/j.icarus.2012.12.021. http://www.sciencedirect.com/science/article/pii/S0019103513000043. ^ a b Beuthe, M.l; Rivoldini, A.; Trinh, A. (2016-09-28). “Enceladus' and Dione's floating ice shells supported by minimum stress isostasy”. Geophysical Research Letters. arXiv:1610.00548. Bibcode: 2016GeoRL..4310088B. doi:10.1002/2016GL070650. ^ a b c Robert L. Tokar; Robert E. Johnson; Michelle F. Thomsen; Edward C. Sittler; Andrew J. Coates (10 January 2012). “Detection of Exospheric O2+ at Saturn's Moon Dione”. Geophysical Research Letters. Bibcode: 2012GeoRL..39.3105T. doi:10.1029/2011GL050452. オリジナルの2012-03-03時点によるアーカイブ。. https://web.archive.org/web/20120303135700/http://www.agu.org/pubs/crossref/pip/2011GL050452.shtml 2012年3月2日閲覧。. ^ Sven Simon; Joachim Saur; itz M. Neubauer; Alexandre Wennmacher; Michele K. Dougherty (2011). 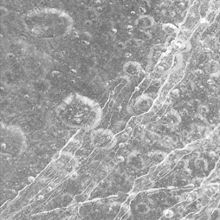 “Magnetic signatures of a tenuous atmosphere at Dione”. Geophysical Research Letters 38 (L15102): 5. Bibcode: 2011GeoRL..3815102S. doi:10.1029/2011GL048454. http://www.agu.org/pubs/crossref/2011/2011GL048454.shtml 2012年3月2日閲覧。.